Thirty years have passed since the Romans left Britain. The power of the Picts and the Scots is growing, and they are pushing inland. In order to save Britain, the great chieftain Vortigern has asked the Saxon brothers Hengist and Horsa to help defend Britain. You and your brother agree to help, but over the years Vortigern has become greedy and does not pay you enough. It is time for you to take matters into your own hands and take what is rightfully yours! You have good maps, strong fighters, and stout boats. The coast is littered with villages, towns, monasteries, and estates. All are waiting to be pillaged! Who will win the thrilling hunt for fame and fortune: Hengist or Horsa? 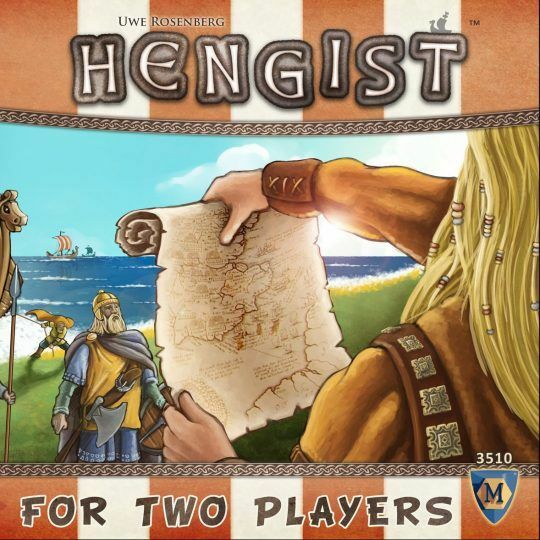 In Hengist, both players compete for the same treasure tiles. The player who reaches a treasure tile with one of his raiding groups first gets the tile — but a part of the road is hidden and must be explored first. Not always is the direct path the most successful way. The player who uses their cards wisely and has a little bit of luck will get the more valuable treasure tiles and win the game.